We enjoy musical performances and talks on a very wide variety of subjects; for example the German Consul General from Edinburgh, The Minister of the German Congregation in Edinburgh and the director of the Goethe Institute in Glasgow have given presentations to our society. On a lighter vein, language games and other activities afford a chance of getting to know each other better. 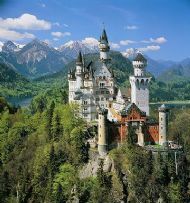 A traditional highlight is the “Weihnachtsfeier” (Christmas celebrations) in December. After long and frequent discussions it has been decided that the official programme, i.e. the talks and presentations will be delivered in English, so that all can understand and enjoy them. For those keen to practise their German language skills, there is an opportunity to do so over a cup of tea/coffee in an informal setting, at the end of the official programme. Germans don't only eat Bratwurst, they also like plenty of fruit and vegetables. Modern construction built in 1972, when the Olympic Games took place in Munich. A holiday resort in the Alps, where you will enjoy skiing in the winter and hiking in the summer. Düsseldorf a flourishing town on the Rhine. 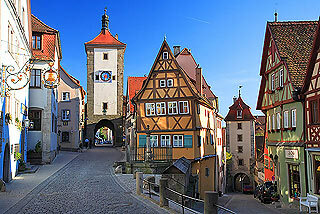 Rothenburg on the "Romantic Road" has kept its medieval image. 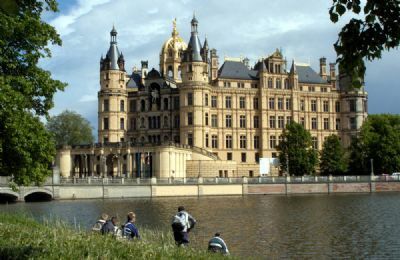 Schwerin is in North Germany. 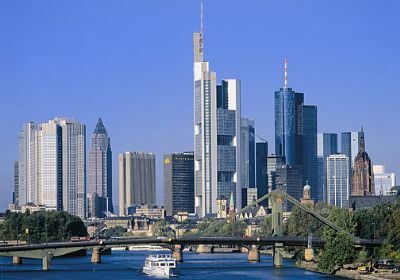 Frankfurt, seat of the European Bank, is a modern city.